Memory Lane Friday is a weekly blog carnival where you can blog about your memories and link up. Everyone is welcome! This week's topic is "An Injury". When I was attending college in Texas, I rescued a severely abused 3 year old quarterhorse. Originally named Cowboy, I gave him a fresh start with the name of Phoenix, and together he and I began a lengthy rehabilition. In the early days, I would just softly put my hand on his neck and he'd be so terrified that his entire body would shake in fear. It took some time before he could be ridden. After I graduated from college and accepted my first job in Houston, Phoenix came along. I found a boarding facility called Oak Hollow. 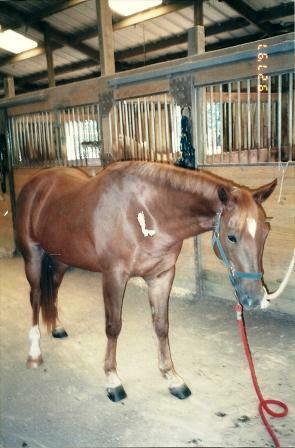 Phoenix had never been boarded before, and he hated the long stall confinements in lieu of his beloved open pastures. He gave it his best, though; he has always had a big heart that way. One day the equine dentist came to file Phoenix's teeth. Horse teeth continue to grow and at times can have uneven wear, causing them pain when a bit is inserted in the mouth, or when they try to chew food. The electric filing of Phoenix's teeth went smoothly, thanks to a heavy dosage of drugs. I decided that while he was doped up I would take advantage by clipping the hair on his ears, something he wouldn't normally allow me to do because he'd been beaten so badly about the head in his youth, and he hated having his head touched in any way. Here is a picture of Phoenix in the cross ties at Oak Hollow. The white spot on his shoulder was actually a tear in the picture that I scanned in - sorry about that. So I had Phoenix in the cross ties but he was still acting up. Tossing his head, trying to step back. The equine dentist saw what was happening and came up with more drugs. She said, "No biggie, I'll just hit him again so you can clip him". So Phoenix got a second shot of dope and I unhooked the cross ties in hopes that he might handle better by lead rope. What happened next is a mystery. I have no further memory of that day. This was all occuring around 9 am, and the next thing I remember was around 5 pm, waking up in the hospital ICU, itching all over due to a reaction to Phenergan. Paul had just walked in the room. No one saw the incident happen, but I was struck on the back of the head with a very hard force. So hard, that my brain bounced to the other side of my skull, causing two skull fractures. I fell to the ground unconscious, and at one point had a seizure. They rushed me to a local hospital, who did a CAT scan and then feared that I would need brain surgery. I was transported to Hermann Hospital in Houston, where they would be capable of handling my needs. All day, I had been asking and begging for Paul, but I wasn't cognisant enough to realize it was tax season and he was at work that Saturday. This was in the day before cell phones, so they just kept leaving messages on our home answering machine. What I believe happened? In analyzing where I was standing in relation to Phoenix and where the point of contact of the skull trauma occured, I think that Phoenix 'set back' - pulled as hard as he could away from me- and knocked me off balance, causing me to fall straight back and hit a concrete step that was behind me. We will never know, though. When I was allowed home, I had follow up appointments. I couldn't hear, so I had to see an ENT. Turns out my ears had filled with blood from the trauma. Fortunately, this corrected itself. I couldn't initially do any math. Not even a simple adding 8+3 in my head. This also righted itself (although I certainly don't have very good math skills, lol). I was able to return to work about a week later, still tender in the head and shaky, but it was good to try to put my mind back to use. I was lucky. The only long term effect is some mild seizure activity in my brain, that can still be picked up by EEG. If I don't get enough sleep, it aggravates the issue, so I try to be proactive in the sleep department. And yeah, I stay away from Japanamation, just in case ;-). My neurologist thinks that with luck, this activity won't ever turn into a true seizure again. As for Phoenix, well, he and I learned to trust one another again. He forgave me for trying to clip him, when I knew he really hated it. And I forgave him for the accidental causing of a very serious injury. These days, Phoenix is a mature 19 years old. He is affectionate and a true pleasure to ride, sensitive to the slightest cues from my legs and seat. I made a promise, all those years ago, that he would always be safe in my care. Simple enter your website in the linky below, then go visit other websites if you have a chance. Next week is a no theme week. Wow - I'm glad that this story has a happy ending! I am so glad you were okay. It sounds like he didn't really want his ears cleaned. OMG! Head injuries are probably the scariest kind! So glad you recovered well. Phoenix is a handsome guy, and that's a perfect new name for him. I'm glad you've both cultivated a great relationship, and that you, to this day, can still enjoy each other's company. My head hurts now and I want to throw up. You made me feel a bit of your pain. Yikes! So glad Phoenix and you are still together - and both alive! thanks for sharing, I have traveled down memory lane today, I've thought about past memories, good and bad, and I have linked up with some travel memories too. Wow! I am glad you were ok! That's so scary. Oh wow, what a scary thing to happen! Glad it had a happy outcome. Phoenix is such a pretty horse. WOW! I am so glad that you are fine now and there wasn't any permanent damage! How scary! Oh my gosh! My knees feel weak after reading your story!! PTL that you not only lived but recovered so beautifully. Wow! Wow! What an experience. The human body is amazing. I'm so glad that you recovered from this. My dad was once "hit in the head," by a horse. He lost short term memory for a while. Man, that scares the crap out of me! I am so gad things ended the way they did. But the whole head injury/spinal injury is a huge fear from me being a horse owner. Gah! I probably be more worried owning a car, but thats so common that we don't think about it... Glad your brain works! Oh, wow. Im so glad you are ok now! That is just a crazy injury. How scary! Oh my goodness how scary. Sooo glad you were ok and I love that at the end you wrote that you guys just learned to trust one another. So sweet.